With well over 100 albums to his credit, Tito Puente was perhaps the most enduring and best-loved Latin superstar. In concert he pointed out for the uninitiated (fans chanting "Salsa! Salsa!" already knew) that he was not Cuban but Puerto Rican -- actually "New Yorican," being a New York native. His work reflects nearly everything in Latin-American music: mambo and other dance rhythms, instrumentals (he played all manner of Latin percussion, piano, alto sax, etc. ), support for vocalists, jazz, and at least one album of pounding drum exotica in the style of Sabu Mart�nez (1960's astounding Tamb�). Ernest (Tito) Puente, Jr. began in 1923 as a dancer and occasional percussionist. Following stints with his sister and a band called Los Happy Boys, he worked his way up to substituting for Machito's drummer in 1941. Only a year before, Arsenio Rodriguez had introduced the conga drum! 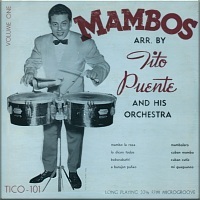 A few 1940s Machito recordings feature Puente on timbales. From there he joined Noro Morales and Jos� Curbelo, followed by the U.S. Navy during WWII and Juilliard. After schooling, he worked for Pupi Campo, providing the arrangements and playing; Pupi Campo recordings are some of the earliest sides arranged by and featuring Puente. He formed his own group in 1949 with Johnny Pacheco, Ray Barretto, and the team of Mongo Santamaria and Willie Bobo. The 1950s were his most productive decade, as he recorded extensively with Tico and RCA Victor. The beautiful Tico albums, recorded with a smaller group, are more authentic but somewhat repetitive. His introduction of the vibraphone and timbal solos into Latin music are heard here. The RCA records vary but include most of his biggest early successes and much of his most creative work. With RCA he had top material and all the personnel necessary to handle big-band Latin jazz. After leaving RCA, two decades with Tico yielded many impressive results. One of Puente's favorite stories is about "Oye Como Va," which was covered by Joe Cuba and later Santana. He had groused about its being called "a Santana tune" until he saw the amount of the royalty check! Santana's hit version drew new attention to its author. As arranger and composer, Puente is considered a major force in Latin and Latin jazz. As Tico's leading mambo-vibes player, and master of timbales and other percussion, his influence is unmatched. And, one of the Palladium's Two Titos, he will be remembered for putting on a tremendous live show. Even his last concert performances on film and television bear out his reputation. Buying: Top picks are most of the early albums on Victor (for much of the greatest use of RCA's resources ever in Latin music) and Tico (for definitive mambo-jazz vibes and timbales). His treatment of Latin soul on later Tico albums is some of the best of that idiom.